The winter quarter at Northwestern is wrapping up, and with it the first offering of my new Medill course for undergraduates from across the university. In response to a suggestion that I find a way to integrate the topics I have been covering for graduate students (economics, marketing, technology, innovation) into the undergraduate curriculum, I went looking for a unifying theme, and I found one in Mountain View, California. Big surprise, eh? 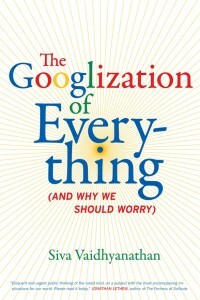 The objective of “The Misspelled Noun That Became a Verb: American Media through the Lens of Google” was to use scholarship, reporting, and reflection about Google to understand the media world around us. The students were to read, think about, react to, and write about excerpts from a handful of books published over the past few years, as well as to combine newspaper and magazine reportage, blog posts, and YouTube videos with observation of their own habits. Jarvis and Vaidhyanathan were gracious enough to Skype in for class sessions during the quarter. William Poundstone, whose Are You Smart Enough to Work at Google? was published in early January, both visited the class and delivered a public lecture (which Vaidhyanathan would have done, too, save for a last-second family emergency). 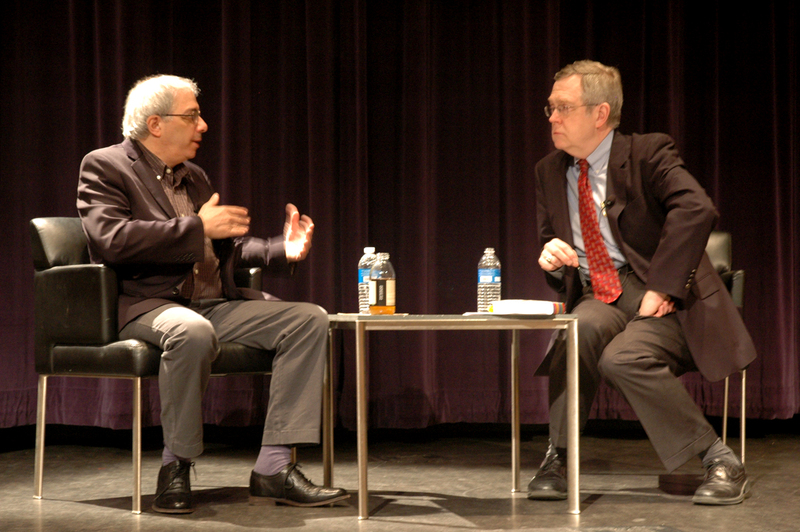 And Levy, as indicated by the photo above, came to campus this week for a conversation with me on stage in the McCormick Tribune Forum (which, if you have an hour and the right version of Microsoft Silverlight, you can watch here or by clicking on the image). On Jan. 12, we were scheduled to discuss the implications for users of personalized search. On Jan. 10, Google launched “Search Plus Your World,” perhaps making it all the more likely that no two people’s search results for the same topic would never be the same again. On Jan. 26, the syllabus called for the first of two sessions on privacy. On Jan. 23, Google announced it was combining 60 of its privacy policies into one; helpfully, it went on to explain why by using some of the same cute stick figures it had been using to outline its extant practices in a print and online advertising campaign it called “Good to Know” (right). On Feb. 2, the topic was video and YouTube. On Jan. 16, the New Yorker ran a fine piece of reportage by John Seabrook about YouTube’s “original channels” initiative. On Jan. 23, Google launched a cute little Web site to trumpet the factoid that one hour of video is now uploaded to YouTube every second. On Feb. 7, since it was a Tuesday, I had scheduled a focus on Google’s impact on democracy as seen through the presidential primaries and campaign. Here I had expected to use as the centerpiece the previous fall’s YouTube-sponsored Republican debate in Orlando, but on Jan. 31 President Obama cheerfully participated in a Google+ “hangout” that helped to round out our subsequent discussion. I could keep going, but you get the idea. Did I mention that the Motorola Mobility acquisition passed antitrust muster on the morning of the mobile class? Add in a visit from by my former Tribune colleague David Tan, now head of SEM agency development for Google, and a field trip to Google’s Chicago offices that Dave hosted near the end of quarter, and you wind up with a pretty interesting quarter, I think. Along the way, the students logged the Google text ads they encountered as they browsed the Web; visited the Northwestern University Library, some for the first time; and debated whether the widespread and automatic use of search engines to answer every question they encounter is making us smarter or dumber. Tuesday’s public conversation with Steven Levy of Wired was essentially the climax to the quarter, as all the themes and ideas listed above, and many more, pulse through his book. For the purposes of my students (all of them, actually; my graduate students read In the Plex for their final on Monday), it was a chance to hear an expert talk not only about the past, but to publicly mull several possible futures. What might Google do with Lake County-based Motorola Mobility?, an audience member asked. Give away its phones for free to tether its users to Google products and services, he suggested. What, then, did the students learn, you ask? I could speculate, but I’ll know better in a couple of days, when they turn in their final papers . . . where they have to tell me whether the pronouncements and warnings in the titles and subtitles of our six main books ring true after a quarter of moving the “Googlization of everything” from the background to the foreground of their consciousness.